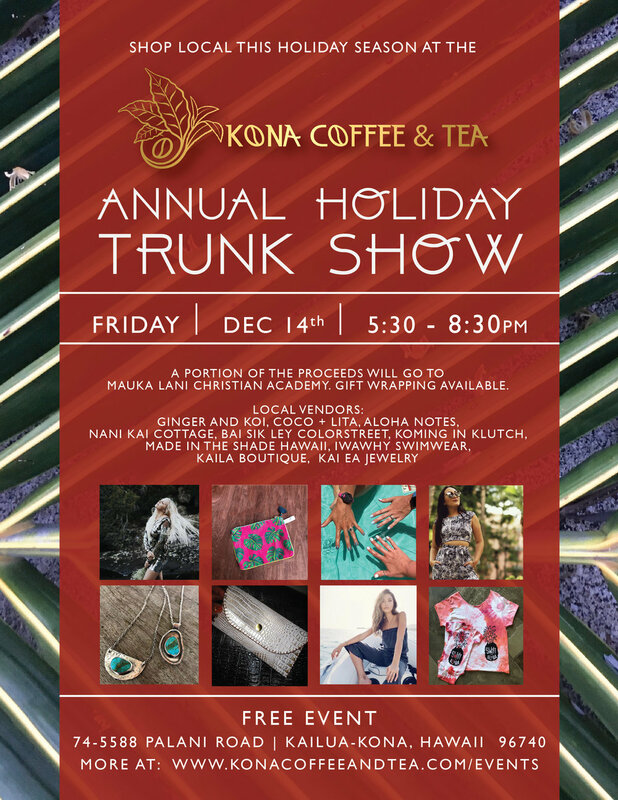 Shop local this holiday season at our Annual Holiday Trunk Show on Friday, December 14th, from 5:30pm to 8:30pm, at our Kailua-Kona café. Enjoy shopping local vendors’ booths while enjoying wine, beer, or barista drinks from Kona Coffee & Tea. A portion of the proceeds will be going to Mauka Lani Christian Academy. Cross off gifts on your list, while supporting local businesses, and having a fun night out! Shop local vendors, including Vendors: Ginger and Koi, Coco + Lita, Aloha Notes, Laurie Scully Jewelry, Bai Sik Ley Colorstreet, Koming in Klutch, Made in the Shade Hawaii, Kaila Boutique, Kai Ea jewelry, Nani Kai Cottage and more. Makua Lani will have a gift wrapping station to get your gifts ready to put under the tree. Drinks and food will be available for purchase from the café, as we’ll be open late (until 8:30 p.m). We’ll have Ola Brew beers and local Kombucha on tap, red, white, and sparkling wines, as well as every barista drink you can think of. See our full menu here. There is no admission charge to this event. There is a $25 fee for vendors. All vendors must be registered ahead of time. If you’re interested in being a vendor, please contact Cherie at cherie@konacoffeeandtea.com.